If the person asking is someone I already know but is a non-writer, it's a point of interest, of connection. They probably at least know a bit about my writing, and it's like asking how work is going, but with the added flair of creativity mystique, of philosophical musing, of... okay, really, they're often just asking “Am I in it?” Sometimes quite directly. Sometimes as a request. Are you either of these first two? This article probably isn't for you. You won't get as many of the jokes, the main constructive point... but you can click elsewhere with the utmost assurance that this is all very funny, super smart, and would absolutely convince you to buy my books. Wait... scroll down to the links in my signature... buy all my work... maybe email me a pony. And a rainbow. Okay... third person asking. This is almost always a direct appeal, a serious tone, a PM on Facebook. This is from the aspiring writer. You have a great idea. A vision of a world from a bolt of thunder in the night, or makes you zone out in the shower and forget exactly how many times you've shampooed already. There's a vision, a vision and a voice, that always awesome voice from the last great movie trailer you saw. It starts with, “In a world...” And you have anywhere from zero to 50,000 words strung together valiantly, painstakingly, and... and you're stuck. Something's wrong. I mean you know it's fantasy, right? There might be magic, dragons, vast hierarchies of Tolkienisms or the very specific repudiation of any and all of the above. Whichever, it's definitely a vision. Maybe even a plot. But... it doesn't feel real. Somehow, the characters just... seem... a little flat. Yeah. It's a great question. This article is definitely meant for you. And believe me, I know what you're going through, and if I can even help to nudge you in the right direction, huzzah. Now, sadly, regardless of the situation and the questioner, I usually give weird, inconsistent, and often even contradictory answers. I'm going to try very hard to get past those right now. You ready? Pithy? Yes. Evasive? Probably. Snarky? Sometimes, maybe... a little. If I get asked before the first caffeine hits. So here we are. The long answer. And it's probably not what you think. And it's probably, to some degree, exactly what you think. For those of you reading this on its own and who don't own my entire series and read every word of each appendix, you may wonder why someone would ask me in particular this question. Well, especially if you've read the most recent Heir of Scars releases, you'll know I have a lot of characters of focus and of depth. I have a strong focus on dialogue, both external and internal, and I tend to develop the characters of focus on multiple time lines. When readers react to my series, they absolutely react to the characters and the way the characters reflect their cultures and struggles. They speak about Adria Idonea, Alexander Pentaros, Shísha, and Mateko... not about the plot or action or detailed languages or whatever else. That comes after. They're invested in the lives of these people, just as I am, the universal human struggles. This is something I've worked very hard to achieve. It's a cornerstone in the suspension of disbelief that is far more crucial for fantasy than most other writing. But I don't create the characters. Not exactly. And no snark or evasion intended. Even still, just as my characters sometimes do, I'll probably gleefully contradict myself one or two times. Or five (I know some of you were thinking it). So let's talk about role-playing. 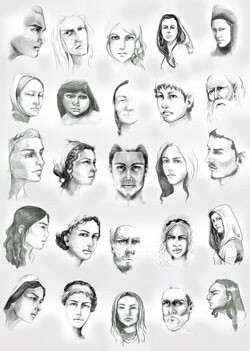 Many of the characters for Heir of Scars were, in some mitochondrial and historical distance, role-playing characters. Sort of. Somewhere, in a box at the top of a closet behind a locked door of a submarine compartment beneath the arctic ice cap where the magnetic needle on the gyrocompass goes typically loopy... there, there is a folder to dust off, maybe even a Trapper Keeper, which holds notebook paper character sheets of Adria, of Alexander, of Kirlin and Oriana. Sort of. Not really. Characters complete with skills ranked by number. With two word descriptions for their moral outlook on the universe. With a specified number of pitons upon their person. No, there is not an ounce (or ml) of shame if you have to look up “piton” in Google and/or a Second or 3.5 Edition manual of some kind. I still play RPGs sometimes, I'll admit. Well, CRPGs. But... that mentality held me back in writing for years. I can remember feeling blocked with storylines for quite some time, because I was very, very worried that the characters were not developed enough. That they did not fit a preconceived notion, like some Platonic character sheet in the ether somewhere, invariable, astrological. This is why I quit some games in the very beginning, even though I use to love such beginnings. If the first thing I have to do is name a character, then create a character, and then, only then start the story...? A surprising number of writers and teachers will give advice along these lines—interestingly, often those focused more on literary and non-genre fiction. Know your characters, inside and out. What are their likes and dislikes? Where are they from? What did they have for breakfast? SAT scores? For me, it's pretty good horrible advice. Or maybe the other way around. It's a pretty idea that the characters generate the story, and we'll get to some of the truth of that, but... and especially, especially in genre fiction, in fantasy: they're born into a world that's already there. They're given a story 40 weeks before birth, and earlier. If they're some idealized reality in a world crafted for their benefit, well... t's why characters remain caricatures. Know your characters. That's not so bad in itself, though it alone won't fill a lecture hall for an hour. But... here's the real trick. Here's the advice I'd have loved to have heard more: Wait, I'll pretentiously start a new paragraph. Never believe you know your characters. To be fair, you'll probably get this advice even in the typical creative writing course. Maybe not said that way. It will be later, and will all involve a character arc, a conflict, a plot a path an epiphany. Stuff like that. Often just as weirdly artificialized. I like to see them simple and right next to each other. Know your characters, but never believe you know your characters. Much more zen this way. Like the tree in the forest clapping one hand. But it's true, and not really that weird. Example: I don't write in order. Not even close. I wrote the ending to Part 8 of HoS long before I had a finished draft of Part 1. It was a great ending. The climax to two storylines in two different times. I loved it. It felt like I had watched it in a movie in a dream in an alternate universe. And as I wrote parts 1-7, I absolutely found Adria and all those around her leading me further and further from that great ending. That great ending. That was truly cool. You'd have loved it. And... you'd have loved Adria less. She would have been more consistent, maybe. Less of a self-contradiction. True to a character sheet. And she wouldn't have grown. She had to grow, no matter if it fundamentally changed the story I was intent on writing. At one point near the end of Hunters of Men, Adria literally decides something very different, even remarks upon it as if she's specifically defying her creator, and I remember writing it and feeling resentment for her, for making my job suddenly harder. And then, of course, I felt the wonder. She is someone I know, someone I love, and yet... she can surprise me. Anger and delight me. That's... a pretty cool way to live, assuming you're locked in a submarine under the ice at the magnetic pole and chained to a keyboard. Well, I can. Don't get me wrong... the only reason a writer is able to create characters is because they know real people. Even if reared by wolves, who for some reason have a smashing good library, and you taught yourself to read and write without human contact, you've still learned from the authors, from their cumulative experience of real life human being persons (btw... nice to meet you, Jack London!). And sure, there are bits and pieces here and there of the substantial world and its denizens mixed up in the ones I create, but... all frog-in-a-blender like, at best. You're probably in there, just like my friends, family, and coworkers, and I don't even know you. Just look. And just like a description of your astrological sign, it's quite easy to see yourself in what you're reading... you just need a couple of positive qualities to identify with, and... proof positive! Congratulations, you're a muse! Seriously, how many books and songs have seemed to have been written just for you? Well, me too. That's a cool feeling... and giving this feeling is the exact job of a writer. The reader has to see themselves and their world in whatever world you create, whether it's the size of a 3:00 pop song or a 4000 page epic fantasy series. Whether the character of focus is a plucky pretty young hero or an abusive slave master crime lord with a third arm inexplicably named Emperor Dorcas. The arm, not the slave master... doesn't matter. Humans look for patterns. Humans craft stories. Not just writers, but everyone. These two qualities (one quality, really) are what make us human, to a very large degree. We attach meaning to patterns. It doesn't matter if it's scientifically quantifiable or superstition or the vast happy hunting grounds in between. It's how we relate. If history is an agreed upon fiction, the present and the future are even moreso. Society could not exist without this. Civilization would never have happened. And no one would every read a novel ever. Okay, what was I talking about? You'll likely have guessed by now that my liberal arts education is worth every B- I earned. Let's bring it all together a bit. Many of my characters, at one point, had a character sheet. But Adria bears little or no relation to what is on that double-sided page or the results of some dice rolls years ago that I probably fudged anyway. She probably reminds you of yourself, or at least you when you were her age, or your sister or your daughter or whomever. Her past speaks to your past, even if you don't know hers. But I've probably never met you. And if I have met you, it's most likely that I wrote that scene you love long before we met, though if you ask me in person I'll probably just smile and nod and let you think what you like. Cause this story is yours now. She is you now. You're the reader and my job here is done. You're jumping on a carousel you're building as you go. As a reader, as a writer. But the carousel's on a train. And the train's in a submarine where the compass just keeps spinning, and it's turtles all the way down (bonus if you know the reference (double bonus if you know the reference for the reference)). Sure, your story has got to grab the reader pretty quickly, and your characters have to be introduced. But they have to have been there long before your reader happens upon them. They have to be realized before the first word and changing faster than you can keep up. And you have to make it all up as you go along. You get where I'm going? I don't want to flirt with pretension and quote Flaubert. Really, I do. No, I don't. Or maybe I do. Yeah, that's a good place to start, well, a good middle to start. It doesn't end the story, but... it continues the story. And that's really the only thing you have to do on your own. Trust me, they'll take care of the rest.